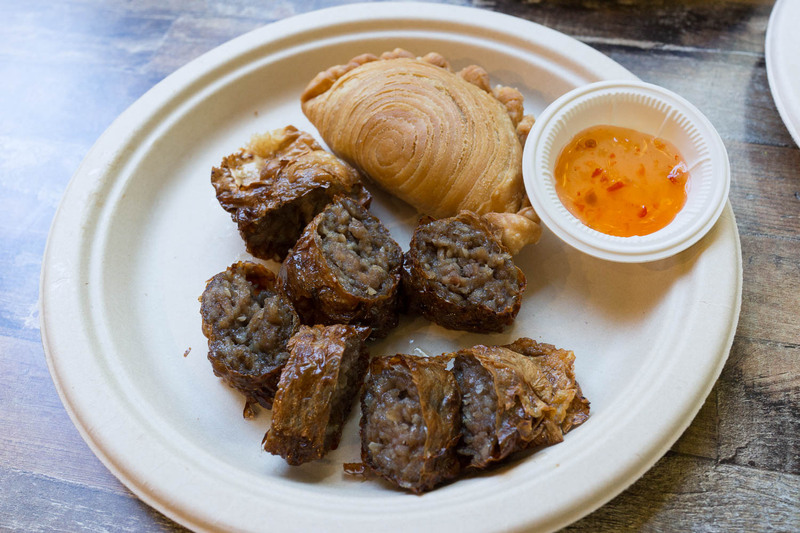 Spice Alley explorations continue with Old Jim Kee, with Malaysian specialties the fare. Noodles for the win. Old Jim Kee (not old Jim Keays) is next up for some exploration along Spice Alley. We've been getting along to Spice Alley for a meal every now and then, it makes a good not-quite-all-the-way-into-Chinatown stopping off point. The row has been open since late 2015 and the quality and prices of the dishes make a decent change from most of the offerings inside Central Park. Spice Alley is a pretty safe space for fussy (those who think 'it's dirty') kind of diners. Our only gripe is the disposable plates and cutlery, melamine and plastic reusable spoons and chopsticks should be the norm, the garbage bins full of plates, bowls, knives and forks is saddening and maddening. Stick to the noodles, sweets and fried dishes folks, more to come. We follow the eating suggestion boards at the front window and start off with a Penang Char Kway Teow $11. There's a goodly amount of prawn, fish cake slice, Chinese sausage and good smokey noodles. A dollop of sambal on the side can be mixed in as you like. Mamak Mee Goreng $11, a fried noodle Indian style with chicken, tofu, potato and egg. The sweet sauce coating the noodles did have a touch of a really sweet rojak sauce, with a light touch on the mentioned chicken and tofu and some creaminess from the egg. Note the careful plating here, it must be hard to style the meal properly when it's served on paper plates. So we get on with the rice meals. Rice with Prawns in Nonya Sauce $12.80. The 'with rice' dishes are where Old Jim Kee goes off the boil. Listed as 'a very tangy sauce, made with fresh chilli, onion, belecan, galangal fresh herbs', it tasted more like a tonne of sugar and oil had been boiled up and coated a mostly raw mix of vegetables and a few just defrosted prawns. This is the kind of dish that gives food courts a bad name. Not good, Jim. We gave them a chance to redeem themselves with the Hainanese pork chop but, um, well a big thumbs down yet again. The chop itself was crisp but the sauce, oh the sauce, sorry Jim but this goopy sweet concoction totally spoiled the dish. The sauce is usually made with ketchup and sugar yes, but this was all sweet and no savoury. It wasn't wasted though, as it became necessary to use it to eat the overly dry rice. We warned you, stick to the fried stuff. On our last visit we went back to the noodle menu. Bihoon goreng - $12 reminds us of 'economical beehoon' in Singapore, as well as the little song our friend Kim sings everytime we mention it. It's a very economical dish indeed, the thin rice vermicelli is simply flavoured with a tomato based sauce but it needed a bit more chilli punch. 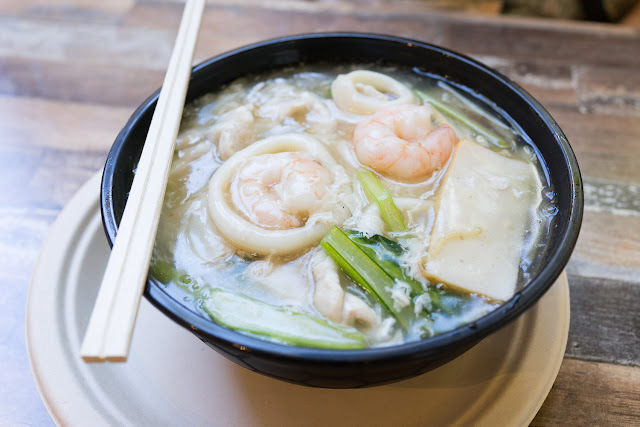 Somewhere between a noodle dish and a soup, Wad Tan Hor ($12) is a two tone dish of adventure. 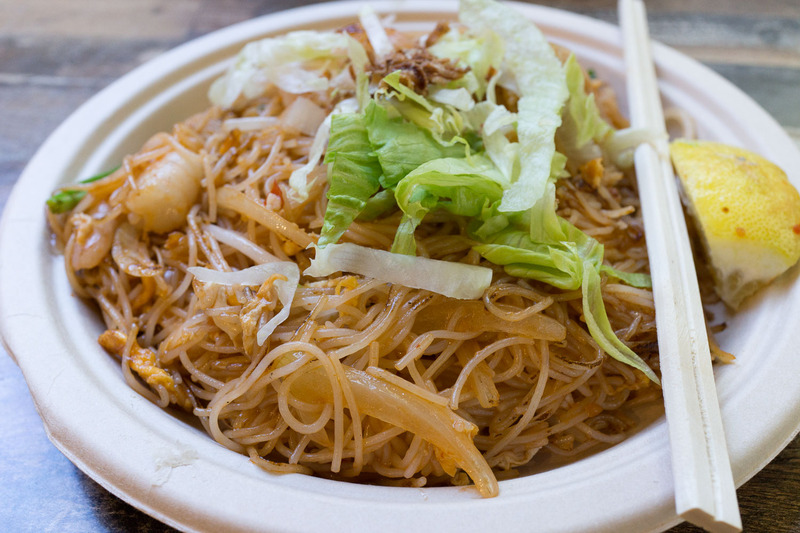 While on top is an eggy thick sauce with some chicken, prawns, squid and fish cake slices, underneath is a layer of soy brown rice noodles which is a little surprising when you first break through the white top layer. This dish also keeps it's temperature heat, not a quick scoffing option. The fried selections on the front counter make for a quick snack or extra kilo inducing side dishes. Curry puffs ($3.50) are nicely pastry flakey and the curry flavoured insides have plenty of potato and sauce. Penang loh bak ($4), a pork filled spiced roll, sits in the window as a long thin roll but gets cut up for you for easier eating. We liked the well cooked outer edges and the texture of the filling. For the biggest bargain in Spice Alley, there's $1.50 salt and pepper chicken wings too. Next to the main cooking station is a sweets cart. Sago gula malaka ($5.50) is up there as one of our favourite desserts, simply tapioca and a melted palm sugar sauce, mixed with a quick pour of some cocount cream. The gula melaka has a deep caramel flavour, almost coffee like. 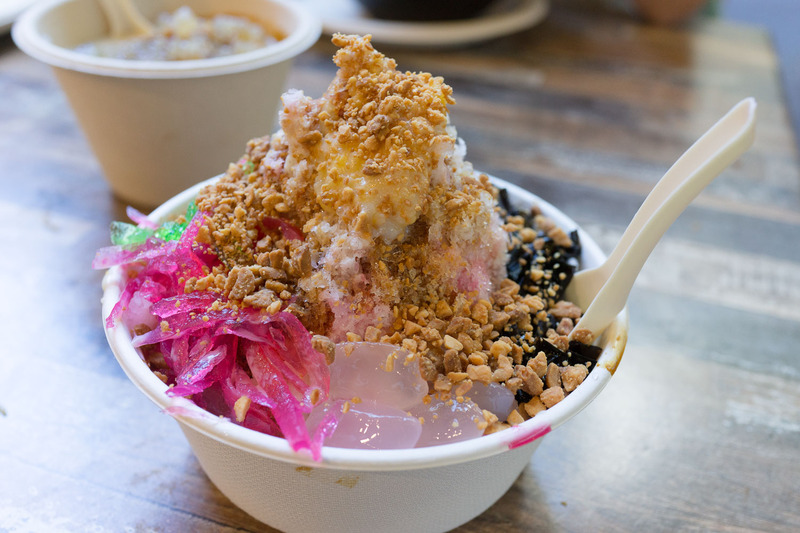 Ice kacang - $6.60. We wish we had known about this at the start of one of Sydney's hottest summers, now it's firmly on our list for a refreshing pit stop. 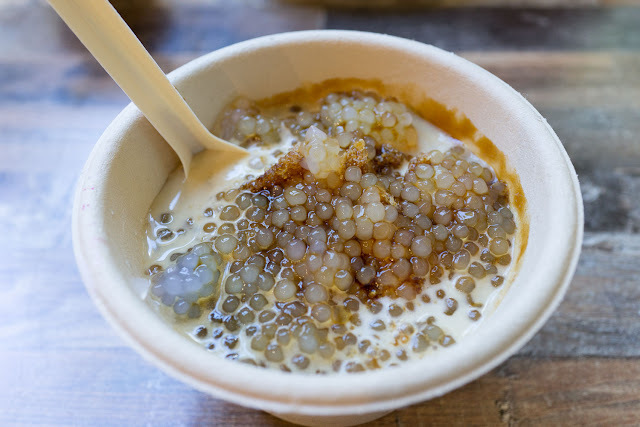 There's a great mix of attap seed, herb jelly, red beans, rose syrup, evaporated milk and so much shaved ice that brain freeze is bound to occur when you mix it together and begin to eat. Insta cool. Old Jim Kee is at 18-20 Kensington Street, Chippendale. Stick to the sweets and noodles.